By learning to photograph birds, you’ll gain a new perspective on their amazing maneuverability and colorful beauty! Capturing a swooping bird shows how they dart swiftly through the air. Seeing a close-up enlightens the viewer to their colorful feathers. Bird photography is a fun and fast-growing hobby. 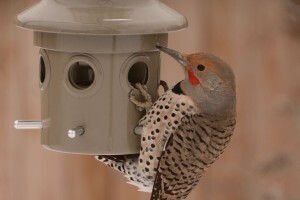 In this post, we’ll teach you the essentials – bird feeder setup, camera gear, and image editing. Apply what you learn and you’ll never see a bird the same! Habitat – birds will be more interested in your food supply if they also have some familiar habitat nearby, such as: cover in bushes, perches on trees, and a source of native plants and insects. Location – as a bird photographer, be creative with your location – inside the house, hidden by the deck, even in a tent – using the camera at the same height as birds makes for powerful pictures! You’re most likely to see birds feeding in the morning, so setup in an area that gets direct sunlight early in the day. All DSLR cameras and even some less-expensive types, will have a setting for shutter speed, which is must if you’re going to capture a bird in flight. Your lens of choice is just that – the right lens for you to enjoy the hobby at your level. A tripod can be very helpful to steady your camera and help you take sharper pictures. Here are some helpful pointers on camera configurations for beginners. Our Capturing Nature/Scenic Photography class covers additional techniques and settings. Exposure – You can get great results using Shutter Priority, an ISO value between 100 – 1250 (though lower is better), and Spot Metering as we defined in the post “Why Metering Modes Matter.” Shutter speeds of around 1/1000th of second are great for photographing flying birds. Sunny conditions will let your camera use faster shutter speeds, improving exposure and image sharpness. 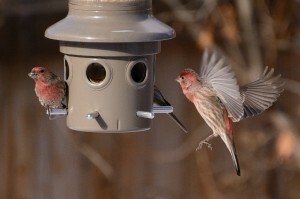 Additional Settings – The auto-focus features work well for photographing birds in your backyard. We encourage our students to explore the advanced features their camera may have like auto-focus lock, which keeps a sharp focus when the lens is zoomed in and the camera is moving around. Use continuous mode to take several pictures within one second to capture bird’s wings in a few positions. Here’s an example showing a house finch in flight captured with a shutter speed of 1/2000th of a second, ISO 600, and spot metering. Pictures produced by today’s cameras are many megapixels in size, allowing the photographer a lot of options for creating their best image with the help of photo editing software such as Photoshop. Utilize the basic functions of Photoshop to straighten and crop to adjust the picture of a small bird into a level, detailed close-up. Adjust exposure and sharpening to polish up your image even more. If you don’t have Photoshop at home, there are many free photo editors for Windows, Mac, and tablets you can use to achieve these basic photo editing techniques. Take a look at the difference in the example below to see what some simple edits can do to bring a Dark-eyed Junco’s liftoff to life. Birds are beautiful and wide-spread animals that we know you’ll appreciate seeing in new ways through photography!